Back to School and New Running Shoes from Kindrunner! 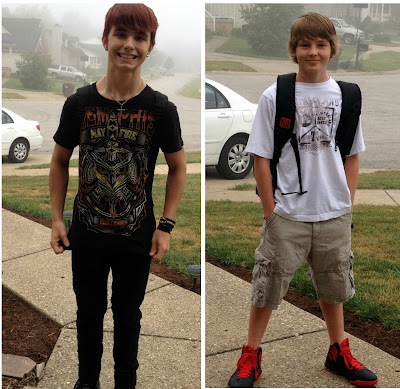 Well, today was back to school for my cutie pie boys! It was a little bittersweet for me. My oldest stepson, Matthew, was home schooled last year, so he was with me 24/7. It wasn't always easy, but it was the best thing for him at the time. Our relationship really grew over the year. I adore my boys! My sweet daycare girls watching their 'brothers' get on the bus! Now onto the fun stuff; shoes!! I became a Kindrunner ambassador a couple months ago, and a couple weeks ago I ordered my first pair of shoes from them! I've been running in my Brooks Pure Flo's for about a year and a half. (And they said they last only 3-500 miles. I blew that WAY out of the water!!) They were the first shoes I wore that didn't give me blisters on my long runs and made my feet feel good. And the first time I wore them I got a 5 minute PR on my 5k!! Well, after putting over 1000 miles on them (I'm guessing, don't know for sure) they started to get a little worn and uncomfortable. So I knew it was time for new ones! I really like the lightweight shoes, and I love Brooks, so decided to stay with what I knew! I ordered the Brooks Pure Flo 2's. Aren't they pretty?? I wore them during my 13 miler last week and my feet were SO happy! What I love about Kindrunner is that they pay for you to ship them your old shoes, and then they donate them to a charity who makes sure that people in the greatest need receive them! And then they give you a $10 credit to use towards your next pair. Are your kiddos back in school yet? You've got some AMAZING legs, woman! Not to be creepy! But you do! Holy WOW! And your shoes are AMAZING! I'm going to need some new ones after my marathon! I didn't know about the "order a 1/2 size larger" thing and my right foot is now missing three toenails! and they are constantly getting re-blistered. I feel fine during my runs, but it's when I stop that I am aware of my toes being hurt. I was lucky enough to have won my shoes on a giveaway, but I'm going to buy the next pair! I love my Mizuno's! But I keep hearing good things about the Pure Flo's! Also, my two oldest girls will be starting school for the first time on September 3rd! The 3-year-old preschool(half day) and the 4-year-old preschool(all day)! I kept my oldest home last year because I wanted the time with her, but I think she would've benefited from being around other people and other friends! So I decided to let my three year old try pre-k out this year! Aww thanks girlie! Not creepy at all!! You totally need new shoes! My Brooks are true to size, I've never had to order bigger. I've heard great things about Mizuno's too, but you should try these next time! Wow, you're going to have a quiet house!! I really want to try Mizuno's sometime too! I think schools around here go back a lot sooner than most schools do. Which is fine with me, but not so much the kids! When you do get new shoes, you should check out Kindrunner, I got them cheaper there than anywhere else I looked! Hope the guys had a great first day of school! Love love love Pure Flows! Aren't they the best?! Is that what you run in too? They are absolutely the best!! The kids in Indy went back last week while I was there visiting. Here in Charleston teachers go back next week and kids the week after. Here, schools don't start until after Labor Day. I run in Asics Gel Foundations. I get about 500 miles from a pair. As a school counselor I start 8/23 and the kiddos start 8/28. Yes, this is a random comment, but you have a Hebrew tat don't you?! I have one as well! Yes I do! It says "YWHW my Strength", What is yours?